带我回家。: Another +1 to age. Basically, Happy Birthday to me! Pretty disappointed, it was the usual bad day to be really honest, and in fact, it was just like any other day that I'm really pissed and really upset but that's normal so whatever, moving on. 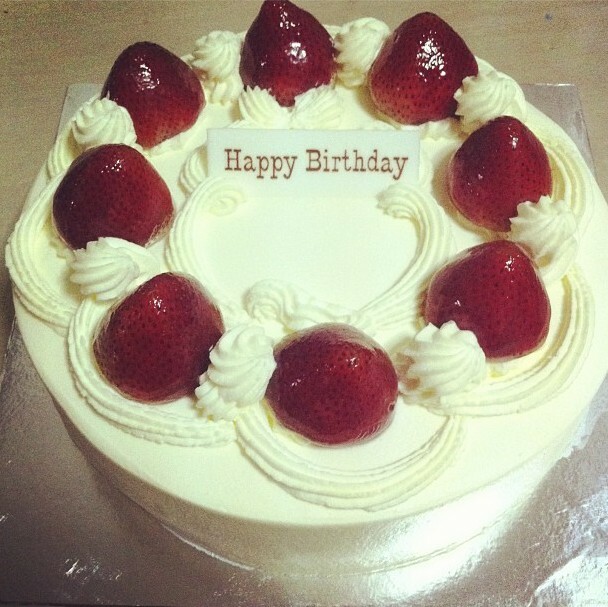 At least I got to eat yummy cake, and got mum to make a home-cook feast (simple meal actually) for me. Well, I don't know if the days are gonna get any better, but I sincerely hope they would. It's been a horrible year since start of year, and I really pray hard that the later half of the year is gonna get better, it had better be better or I don't know anymore. So let's talk about Birthdays. Since I'm bored, I tried to list down reasons why do people celebrate it and why birthdays should be spent feeling happy, all chirpy, and all hyped up.. I mean Happy Birthday just sounds like some greetings, it lacks feeling sometimes (or maybe I'm thinking too much into this) but hey, it's a day to celebrate! 1. It's a day to have fun. Basically, birthday means party, it means good meals, cakes, delicious food, and a day of wishes and greetings, lots of awesome gifts, lots of smiles, lots of fun and lots of things to be happy about. It's a really good chance to just call some people that you haven't met for a long while out and then just hang out and do some catching up, talk about life and enjoy the company of each other. If you'd ask me, yup, that's pretty much all to it. Of course, if someone you're interested in is celebrating their birthday today, it's a perfect chance to buy them something nice, or make them something nice, and score some points for yourself. Wonderful opportunity. 2. It's a day of joy. Joy of what? Of you being born, of your mum free of the burden in her womb, and in celebration of a new life born into this miserable world. Welcome to life. It's a day when your parents hold you in their arms and feel the joy of an addition to the family, it's the start of a new story, the beautiful beginning of a new life; and of course, I believe it is the day that your parents feel the happiest, and most blessed - or maybe at least most parents. But birthday is meant to celebrate the birth of yours, a day that should be happy since... well... you're born :-) A friend once wrote something like instead of 'happy birthday', 'thank you for being born' sounds way better - and i totally agree. 3. It's a day to be selfish. 4. It's the day you become wiser. They always say, older is wiser - maybe not applicable to all - but at least with another +1 year to your age, you have successfully survived another year, you have learnt for another year, you have lived for another year. And in this year, the people you have met, the people you have interacted with, the lessons you have learnt (life lessons of course), and the things you have shared with people. Today marks the brand new day of another year ahead, another year filled with more learnings, more fun, and more things to anticipate. And as you grow, you learn, you experience, and you shall become wiser (if you've learnt well). Actually, this post was really lame and I really sounded like some loser, so I'll just end here before I get exposed. Time to continue watching my Shinhwa on variety show and then go to bed and prepare for a brand new day of battle.